Signs of Spring at Red Hill Farm in Aston! 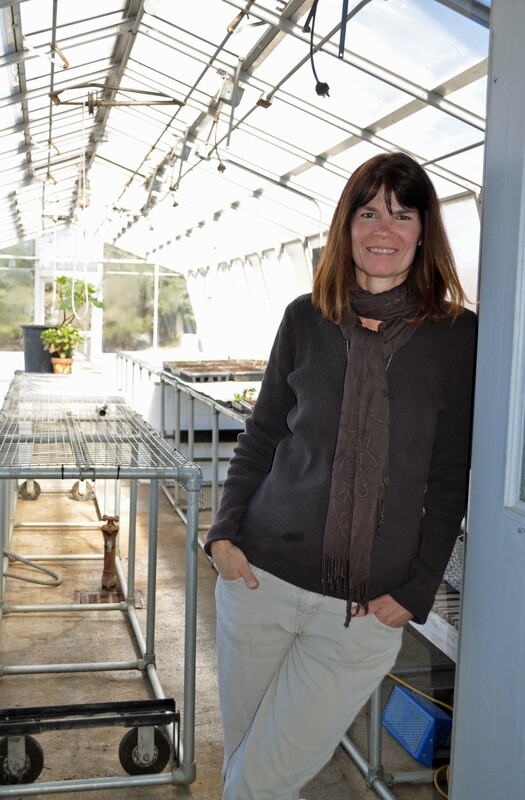 Margaret Lilley, Farm Manager, in the potting shed at Red Hill Farm in Aston. It’s hard to believe that with snow still on the ground and more coming, that spring is less than 20 days away! Friday’s forecast was calling for another 6-12″ so I paid a visit to Margaret Lilley, the Farm Manager at Red Hill Farm in Aston, in search of something green. According to Lilley, the farm workers don’t start until April 1st, however, there were signs of life in the potting shed that restored my faith that spring is near! I caught a glimpse of tiny wisps of green poking out of seedling containers, marking the beginning of the planting season! As we stood in the 70 year old potting shed, Margaret, who goes by Lilley, spoke excitedly about what one could expect by becoming a member in Red Hill Farm. Red Hill Farm is a CSA. A CSA, or Community Supported Agriculture, is a mutually beneficial partnership between a local farm and a neighborhood that desires fresher, healthier produce. As concerns grow over genetically modified food and its unintended consequences, people are looking for the “organic” label on their food. Labeling is only as good as the company behind it, so the best way to know if your food is organic is to know where it is coming from and who is growing it. Red Hill Farm, located in Aston, started about 15 years ago and is owned and operated by the Sisters of St. Francis of Philadelphia, as one of their many environmental initiatives. The farm operates out of a six acre parcel, cradled within 265 acres of undeveloped land owned by the Sisters of St. Francis and is bordered by Convent and Red Hill Roads. If you are familiar with Neumann University, then you’ve probably driven by Red Hill Farm. It’s a peaceful oasis in an otherwise densely populated area of Delaware county: 2,825.8 people per square mile, according to the 2000 census. 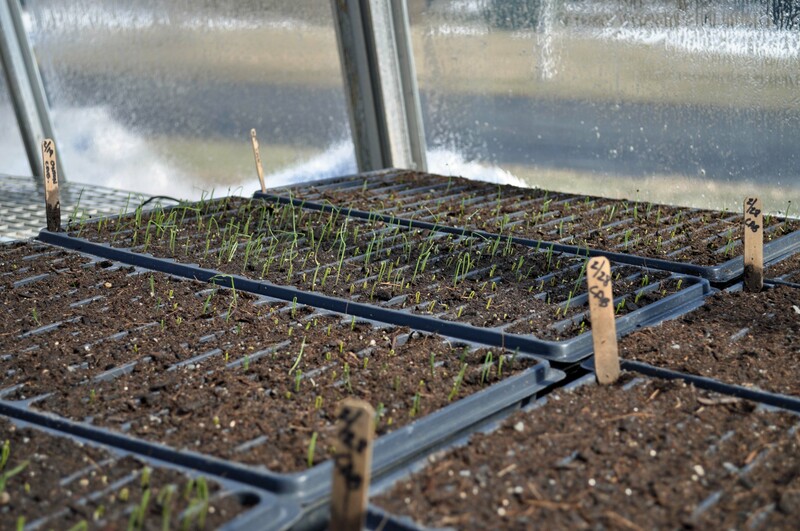 Onion Seedlings On their Way! Onion sets being started at the potting shed at Red Hill Farm in Aston, Pa.
For those looking for organic produce, the farm’s location is easily accessible; located 8 miles from Glen Mills, Pa. and about 5 miles from downtown Chester, Pa., making it a convenient to get to from either direction. Most members are local, many of whom have been with Red Hill from the beginning and are extremely loyal to the farm and what it stands for. However, according to Lilley, they have also attracted members from Philadelphia and the Main Line. 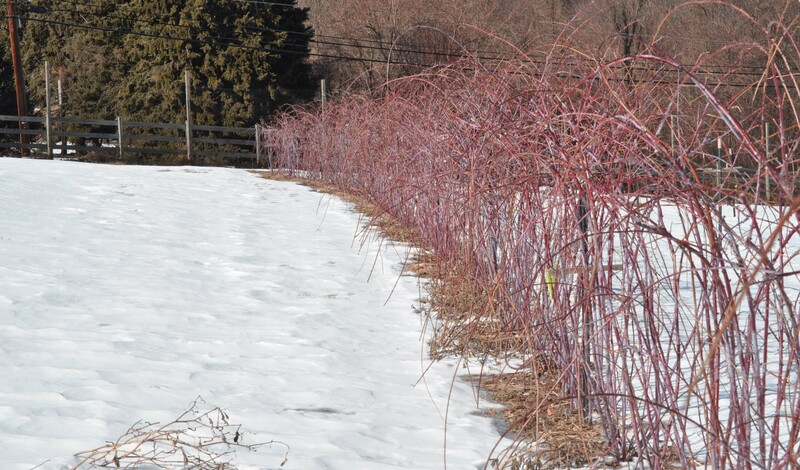 I love seeing the powdery blue-purple branches of the raspberry bushes in winter. The operating budget of a CSA farm is derived from shares that people buy each season. In this way, the risks and benefits of the agricultural season are shared among the members. The goal of this partnership is to break even. In this case of Red Hill Farm, shares cost $750 for a full share and $375 for a half share. This entitles members to 24 weeks of produce and access to the U-pick garden. Any surplus produce is donated to local food pantries. The farm offers about 30 different types of vegetables and the U-pick garden has flowers, berries and herbs. Produce includes things like argula, beans, beets, blackberries, broccoli, cabbage, carrots, celeriac, collards, cucumbers, escarole, eggplant, fennel, flowers, garlic, greens, herbs, hot peppers, kale, kohlrabi, leeks, lettuce, melons, onions, potatoes, radishes, raspberries, salad mix, scallions, spinach, summer squashes, sweet peppers, tomatoes, tomatillo, turnips and winter squash. Blackberry Patch located in front of the barn where produces is picked up. 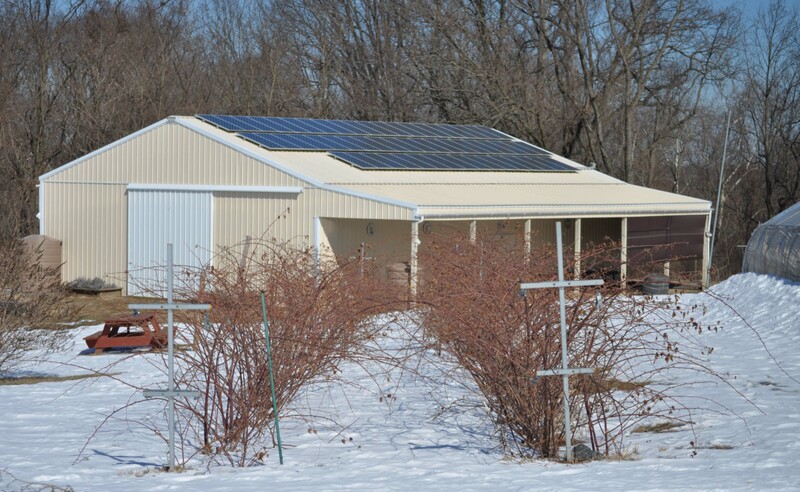 Solar panels power the well and other functions of the barn. Why Should I Care About Buying Locally? Buying locally can take a little more work, however the payoff is great. If you don’t have space for a garden or if your garden is the target of deer and groundhogs as mine is, buying a share in a CSA might make sense for you. The benefits of buying local food is that you eat fresher and healthier food and you also help sustain local agriculture, which in turn helps the environment and local economy. And, I see this in my business all the time–real estate situated close to open space and nice views tends to hold its value. Anything that will preserve the landscape is a good thing for local homeowners. Dormant blackberry bush at Red Hill Farm. If you’d like to educate yourself o n the effects of pesticides, the Environmental Working Group, has a list of foods that traditionally carry high amounts of pesticide residue and the Organic Consumers Organization has a newsletter you can sign up for. Pesticides, growth hormones and genetically modified foods have been linked to a host of ailments to people and the planet. You’ve probably heard about the die-off of bees and monarch butterflies. It has been suggested that pesticides have contributed to their plight as well, according to this article on Mercola.com. If you would like to find a CSA in your area, check out Local Harvest, a website that will link you to CSAs all over the country. Aston is a convenient place to live, with easy access to major routes, such as I-95 and Route 1 to get you to Philadelphia, Wilmington or across the bridge to New Jersey. If you live in Aston, you have many choices in restaurants, shopping and entertainment throughout the 5.7 mile area that makes up the township. Aston has many options in housing, from apartments to townhomes, condos and single family homes. Aston, served by Penn Delco School District, is particularly attractive to first time home buyers, where the average price for a home is $294K, with the lowest listed home at $203K and the highest at $494K according to a recent search on TrendMLS. As of this writing, there are currently 43 homes for sale in Aston Township. Pam Cloud is a Realtor with Coldwell Banker Preferred in Media. If you would like more information, market reports or sales trends or would like to share information for the Aston area, please contact me or visit my website at www.pamcloudhomes.com. Spring Buyers in Search of Homes for Sale!